Great for small jobs of slicing onions, squash, carrots and other fruits and vegetables. 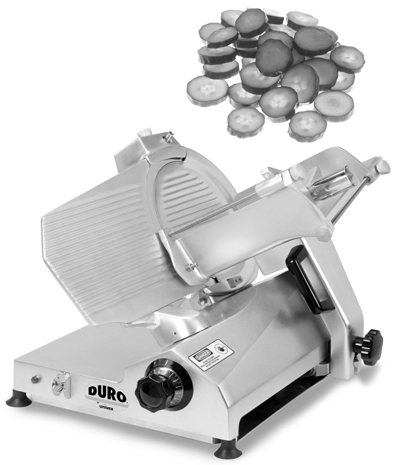 Heavy-duty, belt-driven, manual gravity-feed slicer. German hollow-ground hardened steel, high-carbon chrome-plated blade. Rugged, multi position vegetable holder. Permanent edge guard. Built-in sharpener. Maxiumum slice size 1 3/16". Includes 1 - 12" Slicing Blade.